When I first got the client’s doodle for this piece from Bioneers Collaborative Initiative, a group of pragmatic visionary planners, for the cover of their report, “Dreaming New Mexico,” I hesitated to take it on for a few days. I thought it would be impossible to paint and I didn’t know how to tell them that. It worked as a beautiful theory, but not as an image. There was so much scientific detail that it seemed at first to require a boring and textbook-like map or diagram of some kind with symbolic pattern fills, if the viewer was going to be able to identify the plants in each bed. Yet the whole purpose was to make the abstract idea seem real and appealing to the imagination, even to the taste buds! It was to be a garden that one would think about: food for thought. My client’s original intent was to visualize the hypothetical garden in a realistic way. It was certainly not anything that a photograph could convey. They wanted a painting. So I decided to try to give them one: a digital painting. As it turned out, a little bit of scale exaggeration and idealizing of the plants made this work on its own as a painting. They decided, in the end, not to even violate the painting with little numbers and a key. 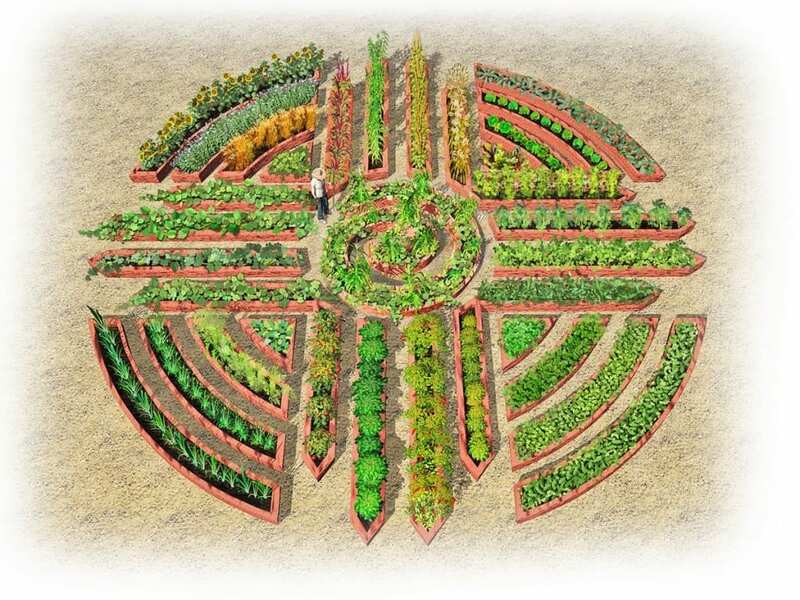 I created a black and white line diagram of the mandala shaped beds and labeled each plant species there. This map was included inside the cover. “Looks wonderful, ” was the email reply to my first tentative color proof. Do you happen to have a comparison of square foot usage for a design like this compared to row cropping? Hi, I would like to ask for your permission to be able to share this on my gardening site.